The New Mexico Domestic Profit Corporation Articles of Incorporation | Form SOS-DPR should be filled out and submitted to the New Mexico Corporations and Businesses Bureau in the New Mexico State Department. This form must be filed in duplicate. That is, you may complete it, have it signed, then copy or you may complete it, copy it, then sign both copies. This form must be accompanied with the Statement of Acceptance of Appointment by Designated Initial Registered Agent, which the Registered Agent you have obtained for your corporation must fill out and sign. Finally the Document Delivery Instruction form must be completed. Here, you must report your contact information along with how the copy of your articles and Certificate of Incorporation should be sent to you once it is approved. It is worth noting that if you elect to pick up these documents, the New Mexico Corporations and Businesses Bureau will not hold these document longer than five business days after you have been notified of their completion. This is not the only documentation that may be required to be submitted with these articles. In fact, the New Mexico Corporations and Businesses Bureau is not the only interested governing body that will hold Incorporators accountable if they attempt to conduct business as a corporation without fulfilling their requirements. This document and its supporting paperwork must be submitted by mail to Secretary of State, Corporation Bureau, 325 Gaspar, Ste 300, Santa Fe, NM 87501. This must also be accompanied with Full Payment of all applicable fees. including the Filing Fee. The Filing Fee for the New Mexico Articles of Incorporation is calculated as $1.00 for every 1,000 shares of authorized stock with a minimum payment set as $100.00 and a maximum payment of $1,000.00. 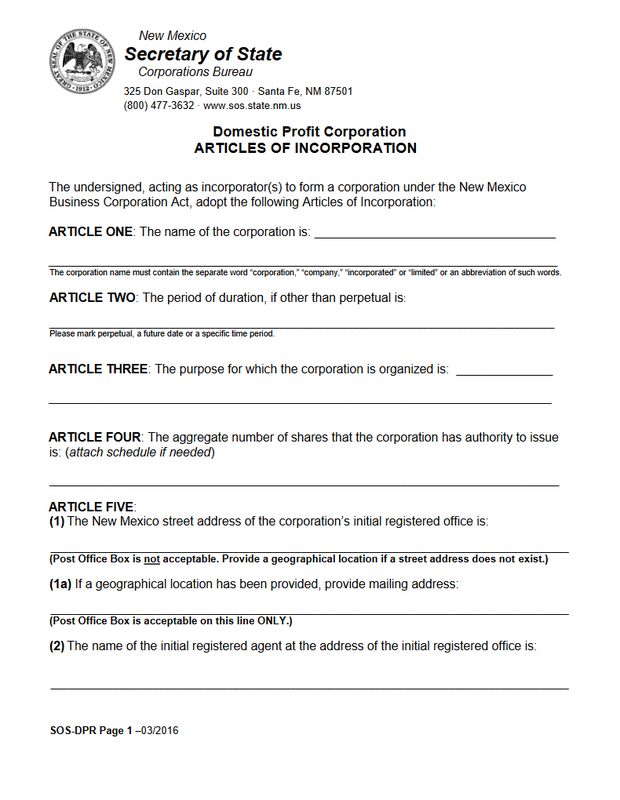 Step 1 - Download the New Mexico Articles of Incorporation Domestic Profit Corporation and the New Mexico Domestic Profit Corporation Statement of Acceptance of Appointment by Designated Initial Registered Agent by selecting the link “Download Form” above. Then download the Document Delivery Instructions form by selecting the link labeled “Download Delivery Instructions” above. Step 4 - In Article Three, you will need to define the Purpose of the corporation being formed. This should cover the reason of its formation and how its business will be conducted as a corporation in this state. Step 5 - The next article, Article Four, requires you document the Total Number of Shares this corporation has been authorized to issue. If you have different classes of shares, you must report the classes, the series, the par value, and any privileges or limitations of each class. Make sure this is a properly labeled document that is attached. Step 6 - Now, locate Article Five, on the blank line in section (1) enter the Street Address of the corporation’s Initial Registered Office. This must be the Physical Address of the Registered Office and you may not use a P.O. Box in this section. If the Registered Office is outside of municipality and has no true address you must Fully describe its location using well known land marks. Be very specific. Do this in section (1a) if there is no physical address to report. In section (2), enter the Full Name of the Initial Registered Agent on the blank line provided. Step 7 -Locate Article Six, at the top of the second page, there will be two columns here. Report the Full Name and Full Address of each Direction who will serve on the Initial Board of Directors. This must be a complete list and may be continued on another sheet of paper. Step 8 - In Article Seven, you must provide a complete list of all Incorporators. You will need to report the Full Name and the the Full Address of each Incorporator. If necessary, you may continue the list on a separate sheet of paper. Step 9 - The final section is “Signature of Incorporators.” First, on the Date line, report the Date this document is being Signed. 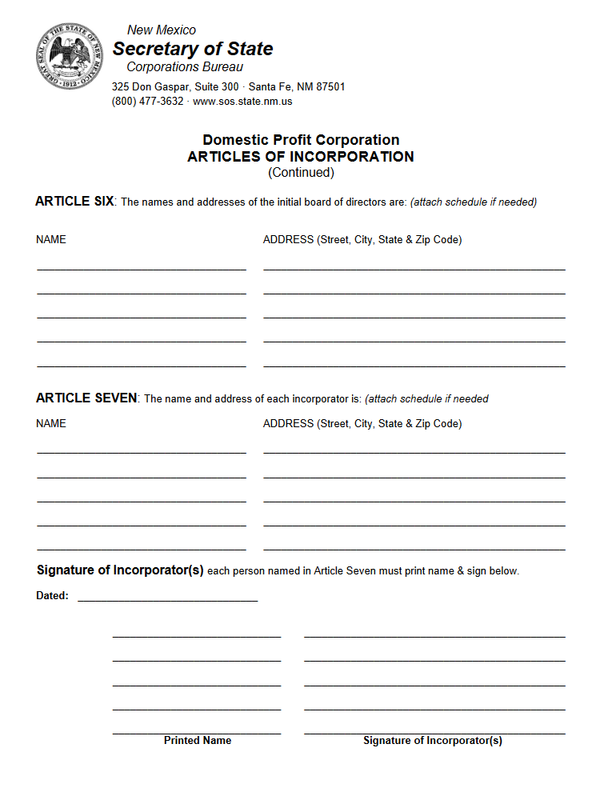 Below this, each Incorporator listed in Article Seven must Sign and Print his/her Name. If necessary, you may continue this on another sheet of paper. This must be a separate document then the Incorporator list provided earlier. Step 10 - Make sure the Registered Agent has provided a Signed and completed Domestic Profit Corporation Statement of Acceptance of Appointment By Designated Initial Registered Agent, make sure you have filled out the Document Delivery Form, then calculate the Filing Fee at $1.00 for every 1,000 shares (minimum payment: $100.00 maximum payment $1,000.00). Finally gather all required documents, including the original and copy (both signed) of the completed New Mexico Articles of Incorporation Domestic Profit Corporation and a check or money order made out to “Secretary of State” for the full amount of all applicable fees (including Filing Fee) into a package you can mail.